British Columbia&apos;s world famous Royal Hudson #2860 steam locomotive is going back together. The final phase of a three-year major repair project to the boiler and firebox got underway this past week, when the first of the newly manufactured boiler tubes was installed. When completed, the three-year project will have cost $500,000. 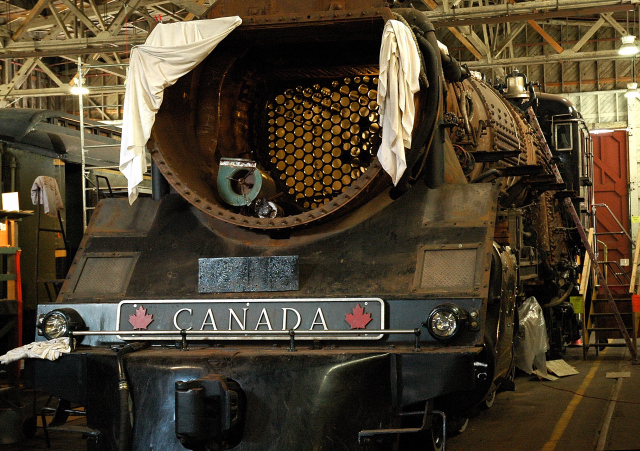 Reassembly of Royal Hudson began the week of March 13, 2006. Photo by Don Evans. "It&apos;s exciting to see this huge project nearing completion", said Don Evans, Executive Director of the West Coast Railway Association (WCRA), whose volunteers and staff are carrying out the project at the West Coast Railway Heritage Park in Squamish, B.C. "We hope to be able to complete all the tests and steam the giant locomotive before this summer". Two years of work has already been done, with careful disassembly of the boiler and parts, work to prepare all surfaces to like new condition, careful and frequent inspections by regulatory agencies, and the custom manufacture of all the new parts needed. Now the final step is to install all the new parts and complete the reassembly of the locomotive. Royal Hudson #2860 carried tourists between North Vancouver and Squamish from 1974 until 1999, becoming one of the Vancouver area&apos;s top attractions. After completing the 1999 season, however, the locomotive was not able to pass inspections for continued operation without boiler work. She was pulled from service and set aside for this future work, but then put up for disposition by the Province in 2002. A joint proposal from the WCRA and the District of Squamish was made and accepted, and #2860 moved to the West Coast Railway Heritage Park in that year. Fundraising got underway and the boiler repair project started in 2004. The West Coast Railway Heritage Park is a project of the WCRA, a private not for profit charitable organization. The WCRA presents Western Canada&apos;s largest collection of heritage railway equipment, and is now "Home of the Royal Hudson." In 2005 the Heritage Park hosted 40,000 guests from all over the world. The Heritage Park is open daily all year, and a viewing platform is available in the locomotive shop so visitors can watch work on the Royal Hudson as it is carried out. For more information please visit this link, or send email to executivedirector@wcra.org.